Butler University and the Center for Urban Ecology (CUE) will both be inducted into the Green Lights Hall of Fame on September 15 at the Christian Theological Seminary. The Green Light Awards­—a series of climate solutions compiled by Sustainable Indiana 2016 as part of the Bicentennial—are distributed to organizations and individuals who are at the forefront of promoting sustainability across the state of Indiana. The CUE is being recognized for its efforts to study, practice, and educate sustainable solutions for urban environments such as the CUE Farm, research on urban wildlife, and the Make Change Indy program that rewarded 440 Indianapolis residents for engaging in a total of 950 hours of sustainable activities. The second recognition of the evening will be presented to Butler President James M. Danko for signing the American College & University Presidents’ Climate Commitment in 2012 and taking subsequent steps to meet this commitment to achieve carbon neutrality on Butler University’s campus by 2050. Sustainable initiatives on Butler’s campus to date have included two LEED Gold-certified buildings and one LEED Silver renovation, rain gardens and permeable bike lanes, motion sensor and LED lighting, the CUE Farm, and composting of food waste, among others. Each awardee was featured in a green Legacy story on the Sustainable Indiana 2016 website throughout the past year. Professor Emeritus of Music James Briscoe, Professor of Education Suneeta Kercood, and Professor of Communication Ann Savage will be honored with Butler University’s 2016 Distinguished Faculty Awards. The awards will be presented Wednesday, August 17, at the Fall Academic Workshop. Winners receive a recognition plaque and a $3,000 stipend. The Faculty Development Advisory Committee reviewed nominations across three categories—teaching; research, scholarship, and creative work; and service and leadership. Nominations can come from anyone, but this year’s winners were all nominated by fellow faculty members. More information about the Distinguished Faculty Awards can be found here. More about each winner follows. Briscoe, who is being honored for teaching, spent 36 years on the Butler faculty before retiring at the end of the 2015–2016 academic year. In that time, he taught 30 separate courses at both the undergraduate and graduate level, advised 20 master’s theses and seven undergraduate honors theses, and taught six undergraduate seminars through the Honors Program. 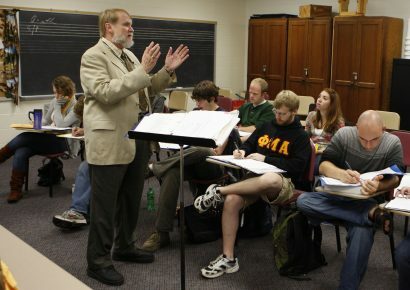 Briscoe established himself as an exemplary and innovative teacher, integrating professional musicological expertise with a passion for the liberal arts. For example, by designing and teaching courses in collaboration with the curator at the Indianapolis Museum of Art even as early as the 1980s, he created an interdisciplinary partnership between Butler and the IMA. He also organized 12 large-scale, weeklong music festivals over a 30-year period that included performances, scholarly lectures, and panel discussions. Throughout his career, Briscoe demonstrated his commitment to the founding principles of Butler University by promoting the study of music composed by women, both in the classroom and in his scholarship. His widely recognized contributions in this area include usable anthologies and other teaching tools on female composers. He also demonstrated his dedication to the value of interdisciplinary education by convincing the founder of the Undergraduate Research Conference to include an Arts section in addition to the natural sciences, for which the URC was created. By organizing the first non-science section of the conference, Briscoe initiated the expansion of the scope of the URC, which has continued to grow over the years and now represents all disciplines taught at Butler University. Suneeta Kercood, who is being recognized for research, scholarship, and creative work, has over 20 years of experience working with children, families, and service providers of individuals with disabilities. She is a highly active researcher in the area of interventions and preventive care in education for individuals with special needs. Since joining the faculty at Butler in 2000, Kercood, who teaches special education, has received 26 grants to support her research and presentations at conferences. She has collaborated with faculty and students from multiple colleges at Butler and from other universities around the world and she has published in journals such as the Journal of Clinical and Experimental Neuropsychology and Contemporary Educational Psychology. She was selected by NIH-NIMHD to receive training in health disparities research, and recently completed a Fulbright senior research scholarship. “Dr. Kercood provides a model for rigorous research and scholarship activity in a department whose predominant focus is extensive teaching,” said a faculty member who nominated her. Ann Savage, who is being awarded for service and leadership, arrived at Butler University in 1998 to discover several gender issues on campus. To begin to address these issues, she worked with Political Science Professor Margaret Brabant to create the Women’s Caucus, which now has over 100 members and was cited as a contributing factor in Butler’s receiving the Mayor’s Celebration of Diversity Award for Leadership in 2006. Savage’s dedication to bringing issues of gender and equality into the fore led to the development of the Presidential Commission on Gender Equity, which involves external review and consultant recommendations. In her discipline, she has served as the Director of the Gender Studies program, which grew from one to over 40 minors under her direction. She teaches in Critical Communication & Media Studies. 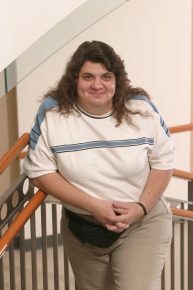 She also led the development of Butler’s major in Gender, Women, and Sexuality Studies and she played a significant role in the establishment of the Collaborative for Critical Inquiry into Race, Gender, and Sexuality, an interdisciplinary group of faculty interested in the relationship between social justice and pedagogy. 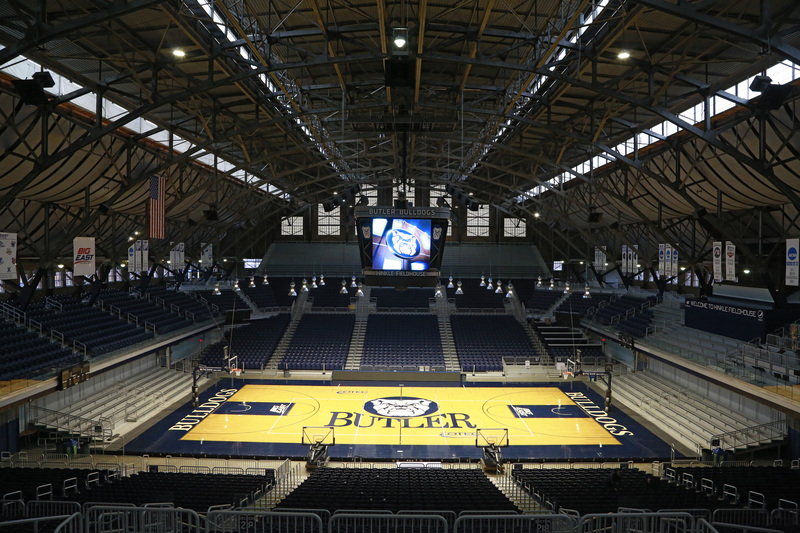 Indiana Landmarks, a private nonprofit organization that saves historic places, has selected Butler University as the winner of its annual Cook Cup for Outstanding Restoration for its preservation of Hinkle Fieldhouse. The dome of Indiana Landmarks Center’s Grand Hall will turn Butler blue when Director of Athletics Barry Collier, Executive Director of Facilities Rich Michal, and Butler Blue III accept the silver cup at an event on April 25 in Indianapolis. 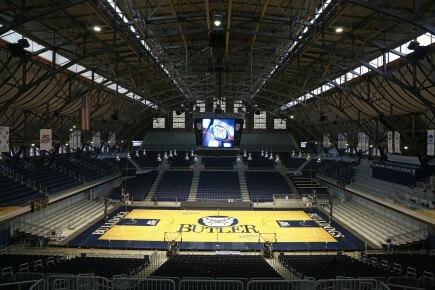 Although Hinkle appeared sturdy and timeless, it was a National Historic Landmark in need of attention before Butler launched a $36.2 million restoration that concluded last year. The university’s enrollment barely topped 1,000 when Fermor Spencer Cannon designed Butler Fieldhouse in 1928 to seat 15,000. The fieldhouse has hosted graduations, addresses by six U.S. presidents, a concert with 125 pianos, indoor track meets in the ‘30s where Jesse Owens set a world record, and a World War II barracks. “Keeping Hinkle, Hinkle” meant tuckpointing all the masonry, restoring the steel-sash windows and replicating those that were too rusted to save. “The windows contribute to Hinkle’s signature ambiance, a place flooded with natural light that lends the exposed steel girders a sculptural quality,” says Indiana Landmarks President Marsh Davis, a Butler alum. Filled over the years with mismatched glass, the windows were retrofit with 9,700 new energy-efficient panes. Because Butler won a federal preservation grant for the window rehab, the entire project followed federal restoration guidelines. Inside, to “make Hinkle more Hinkle,” the restoration removed cement-block offices, storage closets and concession stands under the bleachers and on the concourse. This change returned the original configuration, opening up the concourses and uncovering the trusses that rise up and over the barrel-vaulted ceiling. 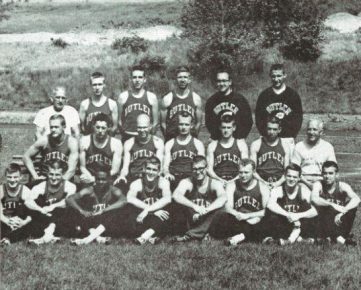 To improve conditions for student athletes and attract recruits, Butler renovated the West Gym and dingy locker rooms, training and workout areas, and the academic center. They created new spaces for these functions and athletic offices in a dark, unused natatorium north of the West Gym, adding two floors in the space, opening up bricked-in windows, and installing an elevator that makes the upper levels of the fieldhouse handicapped accessible for the first time. 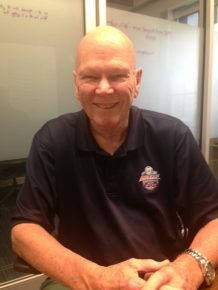 “The restoration means that the Bulldogs can continue to attract student athletes and, in 2115, Hinkle Fieldhouse will still be standing strong,” declares Carl Cook, Indiana Landmarks board chairman and head of the Cook Cup selection committee. He will present the Cook Cup at Rescue Party, an annual benefit for Indiana Landmarks’ Endangered Places programs. Tickets for the April 25 event are $75 per person and must be purchased in advance at rescueparty2015.eventbrite.com or by calling 317-639-4534.